This Identification Guide for Lionel Electric Trains covers the "Post-war Era" only from 1945 until 1969. The Automatic Refrigerated Milk Car No. 3462 was first introduced with this car in 1947, and went on to become one of the most popular of the operating cars of the Post War Era. The car was painted WHITE with BLACK heat-stamped lettering, aluminum doors, and the number "RT3462" stamped to the right of the aluminum doors. The chassis has steps at the four corners and has staple-end trucks with electronic couplers. The magnetic milk cans were loaded manually through a hatch in the roof into a sliding mechanism that has a rubberized man who delivers the cans on to the platform with the use of a No. 6019 or UCS track section that is placed on the platform. The 1947 issues of this car came with seven magnetic milk cans in box No. 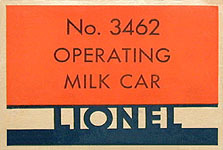 3462-70, however, Lionel found it more convenient to box up six cans, and later issues of this car would have only six milk cans. Variation A: Has a GLOSSY EGGSHELL WHITE color that matches the platform railings. Early 1947 production. Variation B: Has a painted CREAM colored car body. Late 1947 and early 1948 production. Variation C: Has a painted WHITE body. Late 1948 production. Also see No. 6472 and No. 6482 which were the non-operating versions of this car.